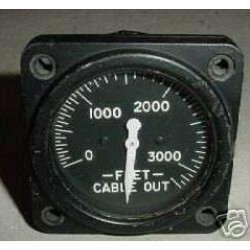 Below are all the indicators and other items that we can not identify the type of aircraft they fit. If you happen to know the type or types of aircraft any of those items fit please email us with that information so we can make the correction and put the item in the correct category it belongs to. Please include item number for our reference so we can make sure we correct the right listing. 2 1/4" Vintage Warbird "Cable out" Position Indicator. Manufactured by General Electric. P/N 8DJ48GBY. Very clean item. It shows very well and it would make an excellent show piece for the bookshelf in the office or home or just as a mock up panel item. 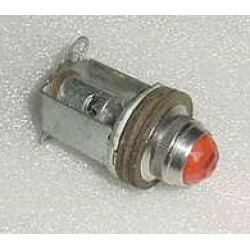 Do you happen to know the type of aircraft this indicator came off?? If so, PLEASE email us with that information so we can make the correction and put the item in the correct category it belongs to. Please include item number for our reference so we can make sure we correct the right listing. 2 1/4" Vintage Warbird "Cable out" Position Indicator. Manufactured by General Electric. P/N 8DJ48GBY. Very clean item. It shows very well and it would make an excellent show piece for the bookshelf in the office or home or just as a mock up panel item. 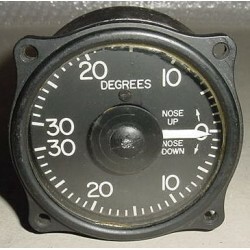 Do you happen to know th..
Vintage Warbird L-2 Autopilot Gyro Horizon Indicator. Manufactured by Motorola. Model 914R1. P/N 96245-01. Very clean item. It would make an excellent show item of the office or home or as a mock up panel instrument. New, nos, Vintage WWII Aircraft Cockpit Warning Light Assembly as shown on photos. P/N unknown. 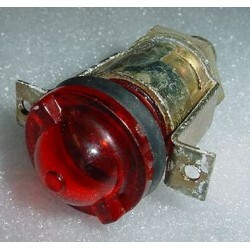 Nos, Vintage WWII Aircraft Cockpit Warning Light Assembly as shown on photo. P/N unknown. Total height 1 13/16". The outside diameter of the glass face enclosure is 5/8" and the height of the cockpit facing section measures 9/16". 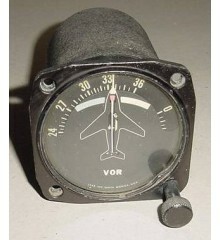 Vintage Warbird Aircraft Speed Control Indicator. Manufactured by Safe Flight Instrument Corp. P/N C70305 or C-70305. Very clean item. It shows very well and it would make an excellent show piece for the bookshelf in the office or home or just as a mock up panel item. 2 1/4" Fuel Quantity Indicator w/ Serviceable Tag. Manufactured by The Liquidometer Corp. P/N EA102AN-117. Very clean item. It shows very well and it would make an excellent show piece for the bookshelf in the office or home or just as a mock up panel item. 2 1/4" Fuel Quantity Indicator w/ Serviceable Tag. Manufactured by The Liquidometer Corp. P/N EA102AN-117. Very clean item. It shows very well and it would make an excellent show piece for the bookshelf in the office or home or just as a mock up panel item. 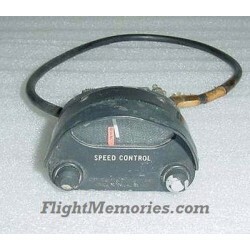 Do you happen to kno..
3 1/8" WWII Warbird 3 in 1 Rudder, Elevator and Aileron Trim Position Indicator. Manufactured by Weston. P/N 59-90108. It shows very well and it would make an excellent show piece for the bookshelf in the office or home or just as a mock up panel instrument. Do you happen to know the type of aircraft this item went on?? If so, PLEASE email us with that information so we can make the correction and put the item in the correct category. Please include item number for our reference so we can make sure we correct the right listing. 3 1/8" WWII Warbird 3 in 1 Rudder, Elevator and Aileron Trim Position Indicator. Manufactured by Weston. P/N 59-90108. It shows very well and it would make an excellent show piece for the bookshelf in the office or home or just as a mock up panel instrument. 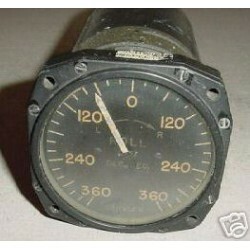 Do you happen to kn..
3 1/8" WWII Aircraft 2 in 1 Oil Pressure / Oil Temperature Indicator. Manufactured by U.S. Gauge. P/N 19848. It shows well and it would make an excellent show piece for the bookshelf in the office or home or just as a mock up panel item. 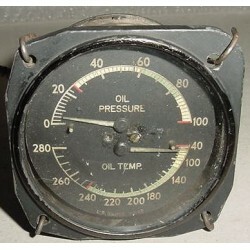 3 1/8" WWII Aircraft 2 in 1 Oil Pressure / Oil Temperature Indicator. Manufactured by U.S. Gauge. P/N 19848.It shows well and it would make an excellent show piece for the bookshelf in the office or home or just as a mock up panel item. Do you happen to know the type of aircraf..
3 1/8" WWII Bomber Aircraft Position Indicator. Manufactured by Weston. P/N 102459. NSN: 6620-00-630-7942. Very clean item. It shows very well and it would make an excellent show piece for the bookshelf in the office or home or just as a mock up panel item. 3 1/8" WWII Bomber Aircraft Position Indicator. Manufactured by Weston. P/N 102459. NSN: 6620-00-630-7942. Very clean item. It shows very well and it would make an excellent show piece for the bookshelf in the office or home or just as a mock up panel item. Do you happen to kno..
3 1/8" WWII Vintage Warbird Temperature Indicator. P/N AN5795-6. Very clean item. It shows very well and it would make an excellent show piece for the bookshelf in the office or home or just as a mock up panel item. 3 1/8" WWII Vintage Warbird Temperature Indicator. P/N AN5795-6. Very clean item. It shows very well and it would make an excellent show piece for the bookshelf in the office or home or just as a mock up panel item. 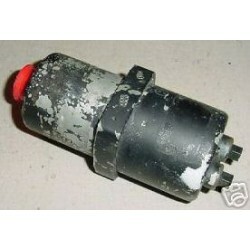 Do you happen to know the type of aircraft this item went on?.. 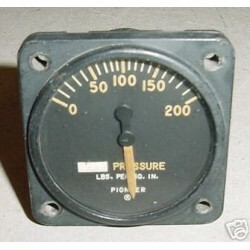 2 1/4" Vintage WWII Warbird Pressure Indicator. Manufactured by Pioneer. P/N 24100-4G-13-A1. Very clean item. It shows very well and it would make an excellent show piece for the bookshelf in the office or home or just as a mock up panel item. 2 1/4" Vintage WWII Warbird Pressure Indicator. Manufactured by Pioneer. P/N 24100-4G-13-A1. Very clean item. It shows very well and it would make an excellent show piece for the bookshelf in the office or home or just as a mock up panel item. Do you happen to know the type of ..
WWII Warbird Instrument Transmitter. P/N unknown, dataplate is missing. Condition, as removed..
3 1/8" WWII Warbird Rate of Roll Indicator. Manufactured by Schwien Engineering Co. P/N 24800-36. Very clean item. It shows very well and it would make an excellent show piece for the bookshelf in the office or home or just as a mock up panel item. 3 1/8" WWII Warbird Rate of Roll Indicator. Manufactured by Schwien Engineering Co. P/N 24800-36. Very clean item. It shows very well and it would make an excellent show piece for the bookshelf in the office or home or just as a mock up panel item. Do you happen to know the ty..
2 1/4" WWII Warbird Vacuum Pressure / Deicer Indicator. Manufactured by US Gauge. P/N AW-1 7/8-16-W. Very clean item. It shows very well and it would make an excellent show piece for the bookshelf in the office or home or just as a mock up panel item. 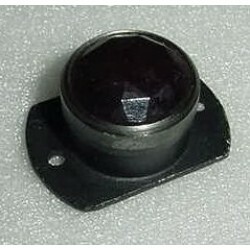 2 1/4" WWII Warbird Vacuum Pressure / Deicer Indicator. 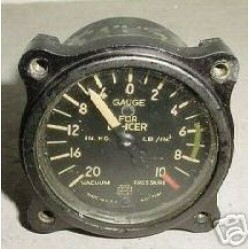 Manufactured by US Gauge. P/N AW-1 7/8-16-W. Very clean item. It shows very well and it would make an excellent show piece for the bookshelf in the office or home or just as a mock up panel item. Do you happen to know the ..